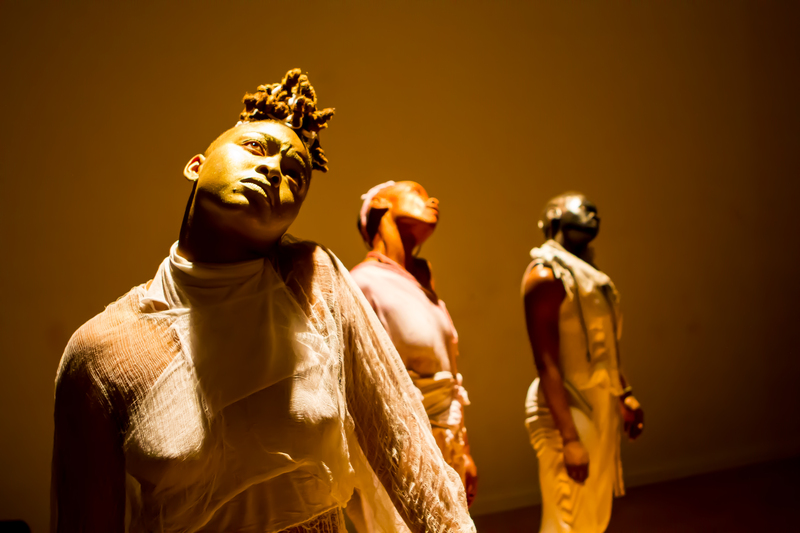 Where to begin recounting Marjani Forté’s being Here…/this time, the last chapter in a three year series of dance works exploring the nexus of racism and public drug policy? 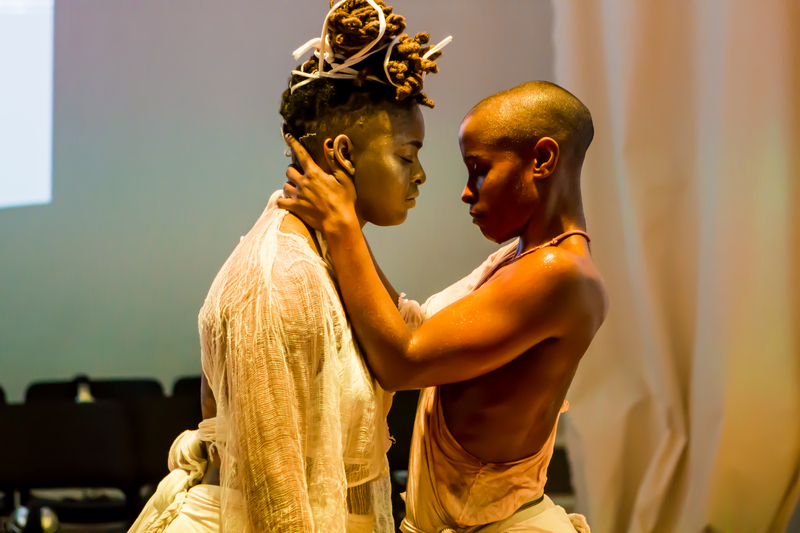 It is undeniably heavy stuff – it’s doubtable that anyone would come to a performance inspired by the intersections of mental illness, addiction, and systemic poverty purely for entertainment. 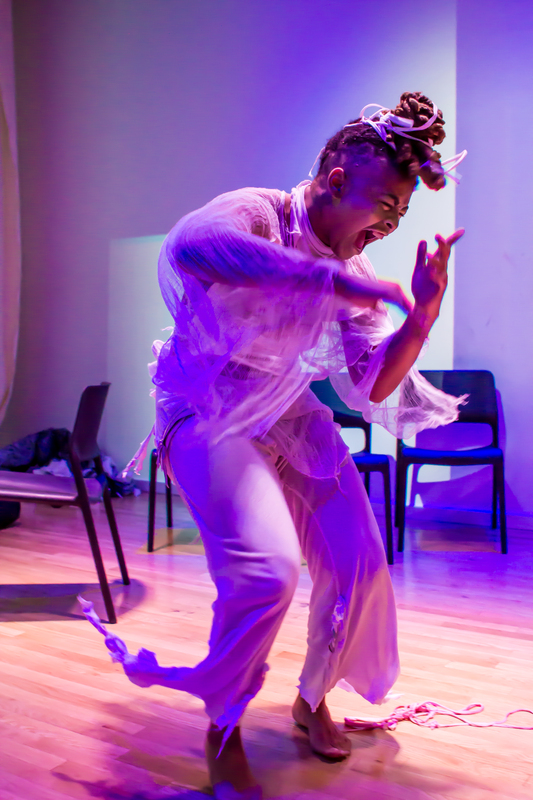 The mood was appropriately solemn as audience members gathered in the bright, open gallery space at Gibney Dance Center, but even steeling yourself against the idea of these themes could not completely prepare you for the onslaught of images and emotions brewing in the studio below. So, maybe the best place to start is at the beginning. Once ushered outside, the audience lined up along Chambers Street to face the steps of City Hall, where a woman was yelling to herself. As she approached her audience, her monologue became clear – she recited the story of Jesus cleansing the temple, sending out the money changers for turning sacred ground into a hotbed of earthly money and assumed power. Cloaked in an old coat and ragged shoes, legs bare and face covered, she was both a prophetess and an unstable crackhead, wisdom and its antithesis. The ironies continued indoors. 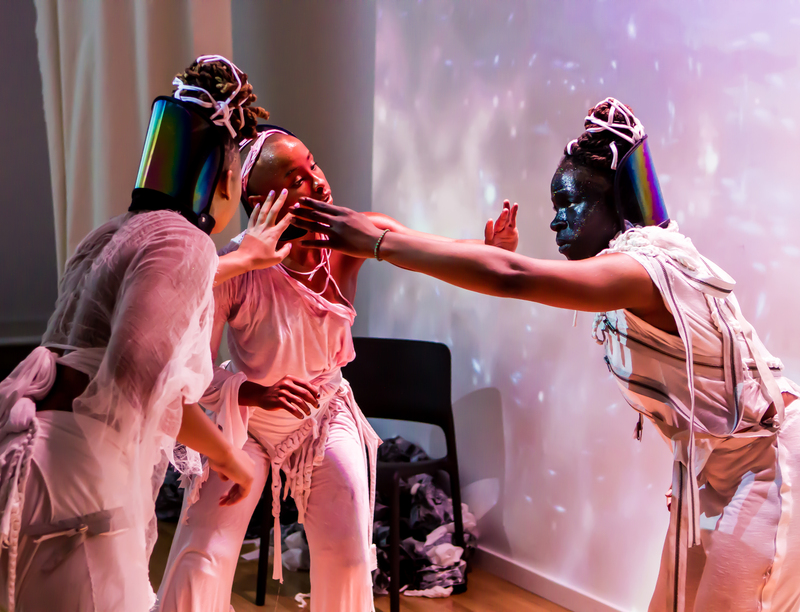 Within Gibney’s small but useful “media lab,” Hearn and fellow performers Ni’Ja Whitson and Tendayi Kuumba wavered on the boundary of health and illness. 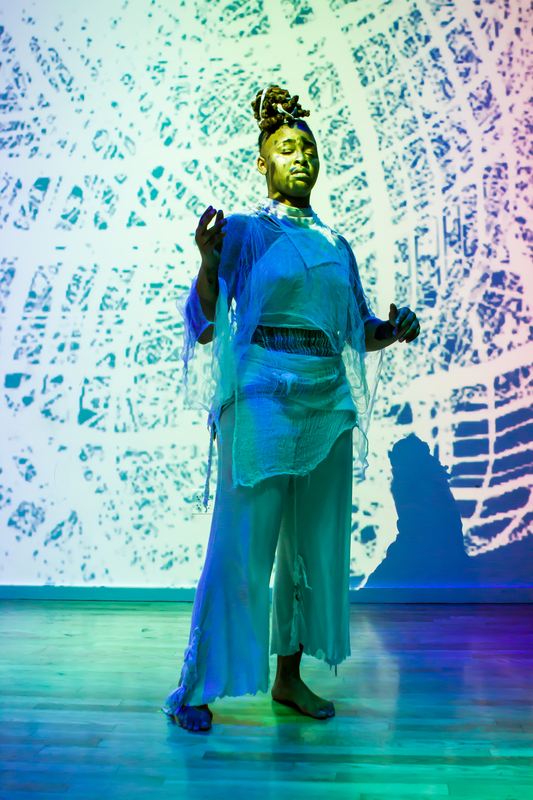 A separation between the audio and visual elements of the work, thanks to Everett Saunders expertly-designed sound score that was delivered through individual headsets, led to the impression that the sound was encompassing the performance rather than supporting the dance, like a scientist describing unwitting specimens in a petri dish. The pathologization of black bodies is a major theme in the work, and Forté takes us back to the Antebellum South with a reading of Samuel Cartwright’s disturbing discourse on “drapetomania” – a so-called mental illness defined by Cartwright that causes a slave to wish to run away – to show the length of this historical thread. As the trio hurtled themselves across the floor, they were both passionate and possessed, kicking their legs and arching their backs in physical displays that might alternately be described as virtuosic or insane. Later on, when acting as contestants on an imaginary (or so you’d hope) game show uncomfortably entitled “Systems of Oppression!,” each dancer takes her turn in the space, fighting against an invisible force and the palpable tension in the room. She is the sacrificial virgin in this demented Rite of Spring, dancing herself into a frenzy only to be reminded by an eerily peppy voice that these systems are designed to thwart all planned escapes. While the three women are incredibly talented dancers and actors, some of the work’s most poignant moments happen in stillness. Two women resting their foreheads together, eyes closed, share a moment of care and compassion, as if vowing to protect each other from the world around them. Stillness can be jarring, too. In the work’s most intimidating moment, the women stand tall, glaring out into the audience as the lights dim and Kendrick Lamar raps, “All my life I want money and power.” Our headphones can no longer protect us. Mr. Saunders has granted the dancers control of the score, and this is their turn to tell the story. Towering over their audience in the small, dark space, they begin to bark like vicious dogs. The spell is broken when one dancer falls to her hands and knees, still barking, changing the image from aggressive to subhuman. But the biggest question remains: why was their strength so frightening? Though the work is simultaneously abstract and symbolic, historical and futuristic, it is also quite clearly a reflection of the very real socially and legally-imposed obstacles that African-Americans continue to face. Throughout the work, the primary offender under interrogation is anti-drug policy, particularly the version set in place by President Nixon when he proclaimed the “war on drugs” in 1971. As Forté explains, the war on drugs has disproportionately affected African-Americans and other minority groups due to racist trends in how drug offenders are handled by courts, such that black and Latino men are more likely to serve time for minor offenses. Similarly, when mental illness and drug abuse combine, jail time is a more common remedy than medical intervention. Thankfully, many politicians have acknowledged the dire need for drug policy reform, and candidates for the 2016 presidential election are already speaking out about their plans to reduce incarceration for drug offenses and prevent repeat offenses. Still, when watching Forté’s work, it’s impossible not to think about Trayvon Martin, Michael Brown, Eric Garner, Tamir Rice, Walter Scott, Freddie Gray, and the countless other people and communities for which policy reform has not come soon enough. In these places and many more, as Forté points out, we’ve seen firsthand the lasting effects of Nixon’s “Southern Strategy” that made “drugs,” “urban,” and “dangerous” synonymous with “black.” The distance between this trauma and recovery can seem insurmountable in the face of tragedies that leave innocent black men dead, but there is hope, and Forté shows that there is beauty in solidarity. Circling back to the title of the piece, by taking knowledge into our own hands and being a presence of positive change in our own communities, we can help what happens here, so this time, things will be different.